Cornell’s most famous animal resident has to be the bear. 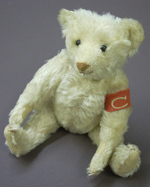 The University has no official mascot, but the image of a bear has long played a role in Cornell athletics. 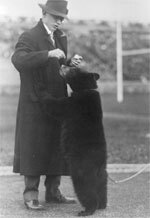 The very first bear to come to campus was purchased by Zoology Professor Burt Green Wilder in 1872 and cared for by John Henry Comstock ’74. While this bear was an amusement to students, its real purpose was to serve as a study object. After a series of adventures and hijinks, such as a surprise late night trip to the University chaplain, the bear eventually became a specimen in the University’s museum. 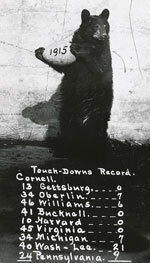 It wasn’t until 1915 when a black bear cub, dubbed Touchdown, began showing up at Cornell football games, that the bear made its indelible impression on the student body. Perhaps it was the presence of this bear that led the 1915 football team to their undefeated national championship season. The idea of keeping a bear on the side-lines was planted, and three more Touchdowns followed through the 1939 season. The first Touchdown was known for climbing the goal posts at games. Football Team in Atlantic City with Touchdown, 1915. At the Cornell vs. Pennsylvania game of 1915, Touchdown was led out on the football field to meet the Penn mascot of the day, a large Husky. Just after this photo was taken, Touchdown raised his paw and smacked the other animal hard enough to send it tumbling to the ground. 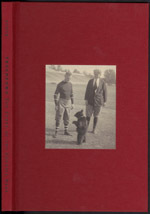 Football coach John Rush and athletic director Rym Berry ’04 appear with Touchdown III on the cover of Touchdown, the Story of the Cornell Bear by John Foote (2008). This bear ended his Cornell career after a celebratory evening that included climbing potted palms in a Cleveland, Ohio nightclub after Cornell’s come-from-behind victory against Ohio State. Coverage of the Cornell victory was almost overshadowed by reportage on Touchdown IV’s wild night out after the game. He was apprehended by the local humane society and did not return to Ithaca with the team. Thus ended the reign of the live Touchdown bears! Touchdown and Robert Kennedy, circa 1965. Having a live animal traveling with a team, often on a train, and prowling the side-lines of a football game can be trouble, especially if that animal is a curious and powerful bear. After some destructive antics by Touchdown IV, it was decided that the bear mascot should remain, but in a tamer form, like the costumed student seen here. The bear infiltrated many aspects of Cornell life, including incorporation into the iconic Johnny’s Big Red Grill sign, the Thirsty Bear Tavern, the college town fire station, and these examples from Willard Straight Hall. Cornell Softball Team with Bear Mascot, 1922.